Stay alive and do the hustle at a 1970's themed disco party! To throw a disco party, you will need a large, empty room. Designate a dance floor by marking the perimeter with duct tape or similar or by hiring a removable dance floor and set up your music (you can hire a DJ or connect your iPod to speakers) nearby. Make sure you have a good selection of disco classics like Abba, the Bee Gees and Cool and the Gang. Just in case there's any confusion, make sure everyone knows it's a disco by adding a few disco essentials. A mirror ball is vital (make one, buy one or hire one) and if you can afford the extra expense, a smoke machine and lights add to the ambience. Get everyone in the disco mood by insisting on 1970's costume. The fashion of the day was tight, bright and slightly tacky – metallic jumpsuits, platform shoes and miniskirts for women and safari suits and bell bottoms for men. Afros were also popular. 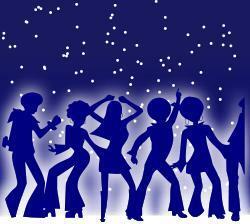 For inspiration, advise your guests to check out movies like Saturday Night Fever, Almost Famous and Boogie Nights. Fondue was wildly popular throughout the seventies. Why not serve a chocolate fondue, with fruit kebabs to dip in melted chocolate? Make Lava Lamp Jelly by layering marshmallows in between scoops of jelly in a parfait glass. The jelly will look like the lava lamp liquid, while the marshmallows will resemble the bubbles. For authentic 1970's recipes, check out this site.